Vastu has their own importance in all lives, cultures. Vastu benefits us to track back and make our life easier, by its utility. Nature provides energy to all the lives in different forms, they differ from lives to lives, some live gets energy from life cycle, some gets via other form. In short, people try to manage more natural energy from nature to get more advantage. To take more advantage, we build “pooja room” and even entire home based on vastu to get more advantage of natural energy. There two kind of effects of natural energy, positive and negative. So, we feel pleasure and pain for and by this energy. So, to get more benefits from god, we do worship them daily or occasionally. If you have build or placed worship room (pooja room) like motioned in vastu sastra, you can get more benefits. How should be your pooja room? Pooja room should be in North-east corner of the house, or near by north-east corner. 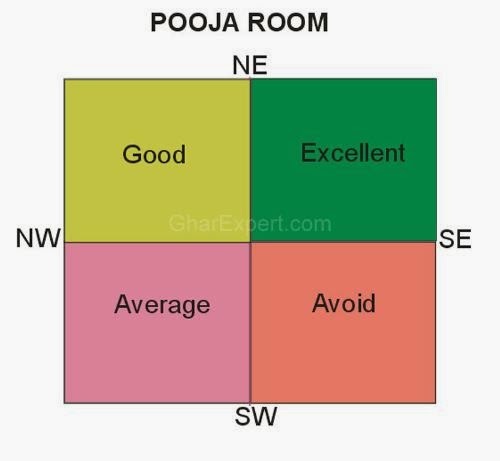 Do not make pooja room in bedroom or in the kitchen. Colors of walls and floor of pooja room should be light white, yellow or light blue. If you have “havan kund” in pooja room than it should be in south-east corner. Your face should be facing north-east or east or north side, while worshiping. As per vastu sastra, drawings of war or pictures of animals are not appropriate in pooja room. Any idol of any god should not be long enough then 4-7 inch in pooja room. Also, idols should be not in front of main door. Broom or dustbin should NOT be in north-east corner or not even near to pooja room. There should be separate broom and mop to clear pooja room and other room of house. If you have idol of lord hanuman, then it should be in south-west angle. But in case if you don't have north-east place free for worship, you can manage to other sides too. 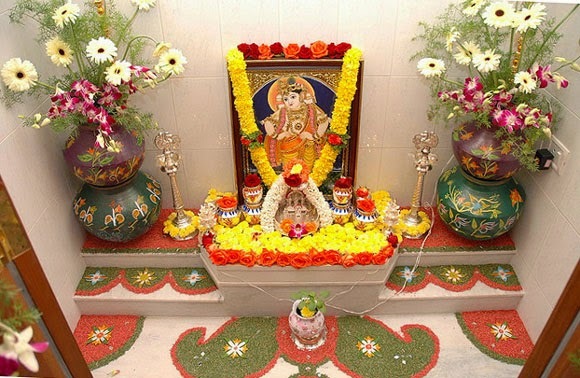 Below image will let you know where should be the pooja room in your house, even more clear.